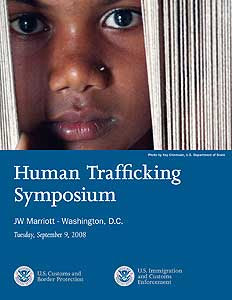 The Human Trafficking Project: Stop Human Trafficking Symposium in Washington D.C.
Stop Human Trafficking Symposium in Washington D.C.
Slavery was abolished a century and a half ago in the United States, but unfortunately this shameful crime lives on, destroying the lives of millions of people, mostly women and children who are forced to work as the equivalent of unpaid prostitutes. Human trafficking, as it is now called, is a border crime, with up to 800,000 people sold across international borders every year, and up to 17,500 brought into the U.S. alone, according to Department of State estimates. U.S. Customs and Border Protection is involved in fighting this crime. We frequently work with our sister agency, Immigration and Customs Enforcement and reinforce the efforts of many other agencies in the U.S. government, as well as non-governmental organizations. CBP has focused many of our resources toward assisting the victims of human trafficking and fighting the perpetrators of this crime, but we want to do more. That is why we, together with ICE, are hosting a one-day joint symposium on the subject. It will be held on September 9, at the J.W. Marriott, 1331 Pennsylvania Avenue NW, Washington D.C. 20004.